Rebecca Mersh Achieves World Youth Qualifying Time. 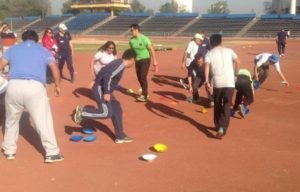 Rebecca MeshRebecca Mersh’s goal of walking at the World Youth Games in Marrakech took great strides forward when she took competed in an event arranged especially to give the top U18 walkers the opportunity to better the tough 24.10 qualifying mark. When it became apparent that there were no 5,000m track walks before the selection date City of Sheffield AC’s John Howley offered to organise a track event as part of the annual Jeff Ford Memorial Walks. Rebecca’s fellow international Johanna Jackson agreed to come down from Redcar to help her keep a constant fast pace going throughout the twelve and a half laps of the track. With 2,000m to go the pair were 8 seconds adrift of the required time but they picked up the pace from 1.57 second laps to 1.54’s in the last 4 laps and Rebecca crossed the line 4 secs inside the required time standard with Johanna 6 seconds ahead. Other races held later in the afternoon around the usual circuits of paths around Don Valley saw Danya Sarayreh win the U13 2km in 11.15 just 2 seconds outside her best time despite have to walk most of the race unpressured by the opposition. Nathan Adams (City of Sheffield AC) won his first National senior title when he led from the start of the RWA 35km and walked an isolated race on the sutton Park course. He maintained a 1 min 30 sec lead through the middle hour of the 3 hour race before stretching his lead to 6 mins. in the closing stages to record 3.06.25. With team mate Peter Ryan coming home third there were hopes of a team victory too, but they were pushed back into silver medal position by 1 point. Nathan’s next race is over 20km in the Dublin European Grand Prix, representing England for the third successive year. Redcar AC’s Johanna Jackson took 4th place in the women’s 10 km championship with a PB of 56.25, her first appearance in this event. 15 year old Rebecca Mersh (City of Sheffield AC) clung determinedly to junior international sophie Hales throughout the race and despite taking the lead around the final bend Rebecca was unable to resist Sophies finishing sprint crossing the line in 13.50.52 for a british record. With a Junior competiton included in the World Cup for the first time Great Britain were represented by two Kingston upon Hull walkers Kayie Stones and Jenny Gagg. 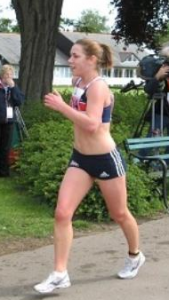 Katie chose one of the most important events on the racing calender to beat her big rival Sophie Hales and lead the British team home to 7th place. Katie produced a PB of 50.29 in 12 place. In the AAA U20 indoor championships in Birmingham Sheffield’s Rebecca Mersh produced a time for the 3,000m walk 16 seconds faster than the all time indoor record held by Sheffield’s own Katie Ford. 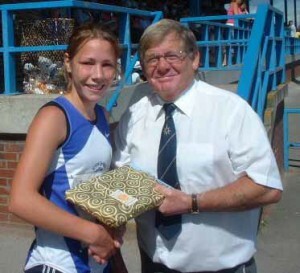 Katie achieved the UK U20 record when she was 16 years old, whilst being coached by her father Jeff Ford who died four years ago. He was national coach and acknowledged as one of the best coaches in the country, his memory will be honoured next month when the Jeff Ford memorial walks are held at Don Valley Stadium. Rebecca has now bettered Katie’s time at the age of 15, though in the race itself she had to settle for third place as internationals Sophie Hales and Katie Stones fought out the lead 20 seconds ahead of her. Confused by the bell being sounded for the leading male walker as he was about to lap her Kingston upon Hull’s Katie Stones put in a big effort and looked to have the race won but defending champion Sophie Hales clawed her back in the last two hundred metres for a two second victory. If two weeks ago you had asked 14 year old race walker Rebecca Mersh what her first major international target was, she would have replied ‘The World Youth Games – Marrakech 2005.’ That target has now been turned on its head after completing her first ever 10,000m race. 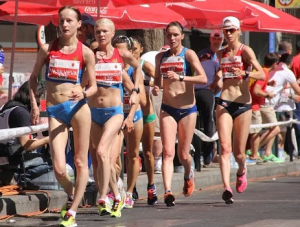 From these results Katie Stones and Neil Bates were selected for the GB team Junior team to compete in the European Cup of Race Walking in Russia.